This is the public profile of Ellia Wang, Additional information and high-resolution images are available for accredited press members, to access additional information about Ellia Wang please login as a press member. About Ellia Wang : Ellia Wang is unique in its innovative designs. Every handbag and accessory is refined to perfect luxury products from the design process, into its creation. Rather than pricing her products at unreasonable price ranges, Ellia Wang decided to delicately balance out the quality, labor, and designs into the prices while keeping them affordable. At Ellia Wang, we believe that every woman should have her own luxury product that shows elegance, class, and style. Each bag was carefully designed to be unique and timeless. With a minimal, yet innovative aesthetic, Ellia Wang products are easily recognizable. 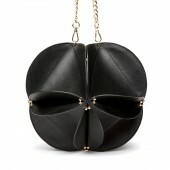 Geometry helped design the Layered Clutch as well as the Flower Bag. With black and white Italian leather, state-of-the-art hardware, and the careful hands of Ellia Wang herself, these items are essentials for any woman at any age. Press Members: Request an exclusive interview with Ellia Wang.